Victoria Beckham x Estée Lauder Modern Mercury Highlighter - The weighty black and gold packaging is absolutely stunning but the product inside is even more beautiful. This is a warm toned highlighter with a very smooth, soft texture. It is a very sophisticated highlighter - not at all glittery and can be layered for a more intense highlight if that is what you want. As you know, I have a bit of a highlighter addiction, but this is the priciest I own at £48 or €58. That being said, it is worth the price and I can safely say that it is one of my favourites. Hourglass Veil Mineral Primer - This primer creates a silky base for foundation to glide over. It blurs pores, plumps fine lines and ensures my makeup looks fresh all day. It doesn't feel greasy on the skin yet doesn't make my dry skin feel even drier. I only need a tiny amount for my full face so I think it is worth the splurge as there it is a 30ml bottle. Definitely one of the most expensive primers I have ever used at £55, but I believe that it is worth it. Hourglass Powder products - As you can see from the photo above, I am a huge fan of Hourglass powder products. The original Ambient Lighting Powders add some luminosity to the skin without actually highlighting. They also blur the appearance of visible pores and what I love most is that they don't cake on the skin or gather in the crease around the nose. I didn't like powders before trying these due to how dry my skin is but these changed my opinion on powders so I highly recommend them. They are priced at £40 each. The bronzer is really beautiful - it has some shimmer running through it but it doesn't look glittery on the skin and I also love to use this on my eyes when I am in a rush. There are currently two shades available with two more in the pipeline, due to be released before summer. £45 here. The Hourglass blushes are probably my favourite ever blush formulation and their palettes are a great way to try a few of the shades - their latest release is the Ambient Strobe Lighting Blush Palette, which has three shades with their ambient strobe highlighting powders intertwined with the blushes to give the cheeks a very healthy glow. I can't get enough of these blushes. They are priced at £32 individually or £59 for the palette of three. Marc Jacobs Velvet Noir Major Volume Mascara - I've never found a budget mascara that truly rivals the high end ones that I love. YSL Faux Cils and this Marc Jacobs one are the very best I have ever used in terms of adding volume and drama to my lashes but without any flaking, smudging or crispiness. I rarely wear false lashes because this mascara is so amazing! Worth the splurge at £22. Charlotte Tilbury Filmstar Bronze & Glow - Apart from the stunning packaging, which is synonymous with Charlotte Tilbury products, the product itself is absolutely beautiful. The contour shade is perfect for adding some soft definition to the face, without any harsh contour lines. The highlight shade is a very flattering gold-champagne colour and it doesn't highlight any texture issues or fine lines. Two really beautiful products for £49 or €65. Burberry Liquid Lip Velvet - Due to having quite dry lips, I'm not the biggest fan of liquid lipsticks, however these lip velvets are the best I have found. They are pigmented, very comfortable to wear, transfer-proof and long-lasting. They don't highlight any lines on my lips or bleed - all round winners! I only own one so far but want to add more to my collection. They are priced at £26 or €28. Armani Luminous Silk - This is my most repurchased foundation because I can depend on it when I want a long-lasting flawless, luminous finish. It gives a medium, buildable coverage and it doesn't settle into any dry areas on the skin or fine lines. It doesn't break down around the nose or chin area and it also glides over visible pores so it really is a brilliant all-round foundation for those with dry skin. Worth every penny of the £40 or €46.50 price tag. Natasha Denona eyeshadows - Regular readers are probably bored of me talking about Natasha Denona eyeshadows but I just can't stop raving about them because of the pigmentation and beautiful texture - they practically blend themselves! Read more in my brand focus post here. A 5 pan palette is priced at £40 or €47.10 and they are sold on BeautyBay. Anastasia Beverly Hills eyeshadows - Another brand of eyeshadows that are definitely worth the hype and splurge are from Anastasia. Her individual shadow pans are now sold on the U.K. website and are priced at £10 each or £50 for 8 plus a free palette or the premade Modern Renaissance Palette is priced at £41 or €50.70. Like the Natasha Denona eyeshadows, these are top quality in terms of pigmentation, texture and blendability. They are smooth and soft - even the mattes, and they apply beautifully on the eye without fading or creasing. Whats not to love? YSL lipsticks - I have a few brands of luxury lipsticks but I had to narrow it down to YSL because my favourite ever lipstick is from the Rouge Volupté line and I also have one from their Pur Couture range which I love. The packaging is stunning, as expected from YSL, and they have that magnetic click closing that we all know and love. The lipsticks themselves are pigmented and creamy, yet not slippy and very comfortable to wear. At £27 or €33, they are pretty pricey and definitely a luxury treat but very much worth it. 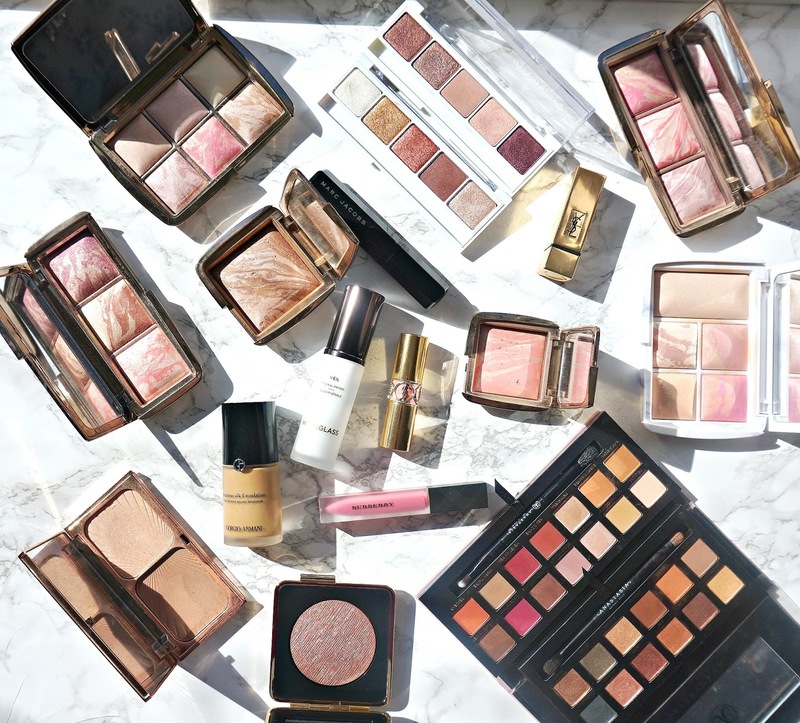 I could probably talk all day about luxury makeup because it's my weakness but there are definitely some products that I have bought that are not really worth the price tags - these, however, are! Have you tried any of these products? I would love to know what your high end favourites are? Please tell me in the comments below!